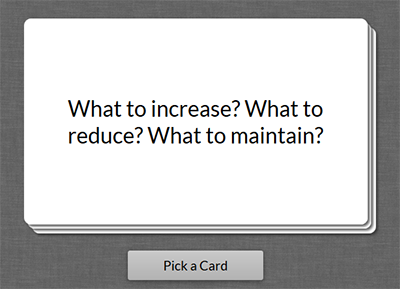 I wasn’t incredibly impressed with any of the online version of Brian Eno’s Oblique Strategies cards that I’ve found, so I made my own set; check it out here. You can read more about the history and philosophy of the Oblique Strategies over here. Or you can do it the other way ’round by selecting the “Camchord” wavetable and clicking “Previous Wavetable.” Is it the most amazing-sounding wavetable you’ve ever heard? Well, no, or else Native Instruments probably would have made it easier to find. It’s got a nice tone, though, especially for bass (as you’d expect), and it’s a cool little Easter egg for dedicated Massive users. For a look at Massive’s non-secret wavetables, check out this article. Open the location of the downloaded ADG, ALS, or ALP file in Finder. Manually add the appropriate file extension to the filename. For example, if you’re trying to open an Ableton rack, you’d add an “.adg” extension, like so: “awesome-bass-fx-rack.adg”. Control-click the file. Select “Open With” from the context menu and click “Ableton Live.” Live should launch and open the rack, pack, or set correctly. Why this happens, I have no idea; if I had to guess, I’d imagine that some part of the zipping process in Windows removes some kind of identifying information that OS X needs to recognize the rack as an Ableton file. There doesn’t seem to be any problem moving zipped Ableton files from one Windows system to another, or transferring an uncompressed Ableton file from Windows to Mac. Recording the sets that you play with Ableton Live allows you to build an archive of your live performances; after the show, you can go back, listen to the set, and figure out what worked and what didn’t. You can always just record into Arrangement View, but writing eight or more audio tracks at once — while also playing clips and running VST effects — can quickly overwhelm your system, causing drop-outs in the audio. Here’s how to record a live PA set in Ableton without any external devices, and without burdening your poor overworked hard drive too much. Create a new audio channel (Ctrl + T) and rename it “Recording.” In the new audio channel’s In/Out section, select “Resampling” from the “Audio From” menu. Arm the channel for recording; the stop button on every clip slot will change to a record button. Ableton will now record the output from the master channel — including any return or master effects that you’re running — onto this audio channel. Now select all of the clip slots in the Recording channel except for the first one. Press Ctrl + E (Command + E on a Mac) to remove the recording buttons from the slots. Start playing the first scene; Ableton will start recording your live PA set into the first clip slot. 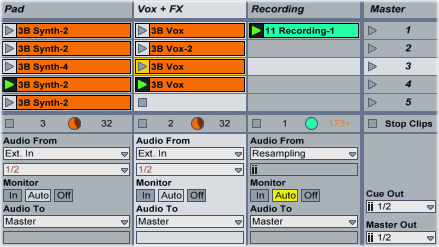 Trigger another scene or clip; instead of starting a new recording, Ableton will keep recording into the first clip slot. In the end, you’ll have one audio file containing your entire set in that slot. When you’re done playing your live PA set, crop the recorded audio file, open it up in your file browser, and transcode it to MP3 or burn it to a CD. Open the “File” menu again. Click “Collect All and Save.” Set all four buttons to “Yes” and click “OK.” Ableton will copy all the samples in the set into the new project folder that you created. The “[Your Set] Project” folder should now contain two sub-folders: “Ableton Project Info” and “Samples,” as well as the ALS file for the set. You can now transfer the “[Your Set] Project” folder to a flash drive, or zip it up and email it.